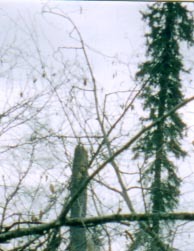 Large tree snapped off about 30 feet from the ground in a circular area of Nine Mile Island a few miles north of Ruby, Alaska. Right outside the circular area, tall trees stood completely unaffected. Photograph © 2003 by Pat McCarty. 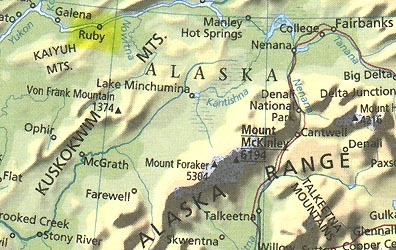 Ruby, Alaska on the Yukon River west of Fairbanks, is a village of 188 people. December 13, 2003 Nine Mile Island, Ruby, Alaska - At the end of August 2003, I reported about a mysterious crop pattern near the Serpent Mound in Ohio discovered on August 24, and the interest of the United States Air Force in that crop pattern and several others that emerged in the Ohio and Wisconsin region during the 2003 summer. What none of us knew was that on the rainy and foggy night of August 22nd near remote Ruby, Alaska (population 188) on the Yukon River, one or more loud jets flew low and loudly up and down the river for about ten minutes, according to witnesses.